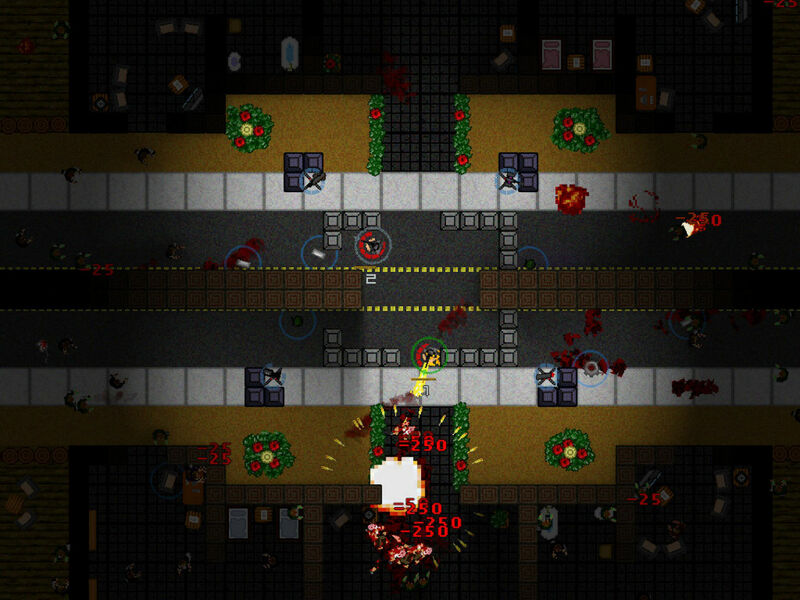 Over 9000 Zombies is a top down shooter presented in a retro pixelated artstyle. The game is primarily a multiplayer focused title and as such I played it with fellow reviewer Fenton, to experience the game as the developer intended. 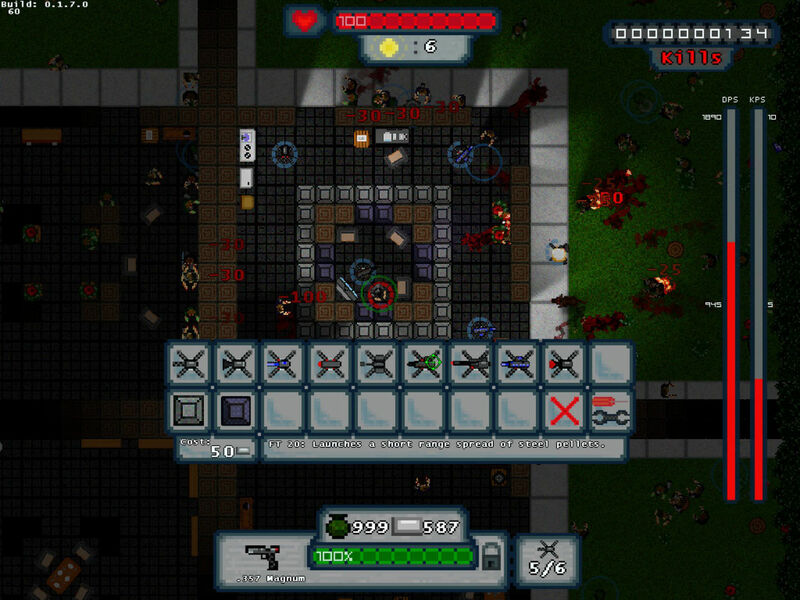 The game puts a different spin on the traditional zombie survival game, while simultaneously keeping the key elements of the genre. There’s still the usual day/night cycle, with safe times to allow the players to catch their collective breaths, there’s still a selection of weapons with which to wreak havoc upon those who would stand against you, and there’s still an unrelenting zombie horde who care not how badass you and your teammates are, they’re just going to keep coming until you eventually go down. Like most zombie games, the idea is that you must re-slay the undead, collect various resources and make sure you survive until… errm, until you have a higher score than the guy next to you? Lets just say that this game isn’t big on the story aspects of game design. And that’s ok. The game, as I said before, is a multiplayer title, with the emphasis squarely on the cooperative and competitive connotations of this style of game. Players will find themselves unconsciously starting to compete with their friends to see who can go longest without dying (the game doesn’t end until the entire party is down), who can kill the most zombies in a single life, or simply who can find the best weapons. Of course, the aim of the game is to survive, so the competition comes on the back of cooperation, as players work together to kill zombies. This serves two purposes in this game, it both reduces pressure on you and your team (obviously, less zombies = less things trying to eat you), and gives you access to drops and power-ups. Yes, I said power-ups. More on that later. The main difference between this game and most modern zombie survival games is the fact that the resources you collect have one purpose: construction. You collect scrap metal and with it, build walls to protect yourself and turrets to help blow away the undead. There’s no worrying about food, ammo, or any other survival aspects that are the staples of most “realistic” zombie games these days, and that’s good as far as I’m concerned. There are six different turrets you can construct, ranging from basic machine guns to plasma bursts and scattershots, each costing an increasing amount of scrap to construct, meaning that your defences will upgrade with each wave. Weapon wise, you start with a basic selection of pistol, rifle and an SMG, with an additional 20 weapons obtained by random drops throughout the game. As I said before, there’s no ammo in the game, you’re limited only by having to reload occasionally, meaning that when you get certain weapons the game quickly can seem very easy providing you picked your spot correctly. This is inevitably short lived however, as you find yourself compelled to leave the safety of your self-built fortress to collect materials, pick up new weapons and bail your teammates out of bad spots. The things that stand out to me the most, are firstly, the inclusion of power-ups, and secondly, the lighting effects. The power-ups are awesome, if unoriginal. 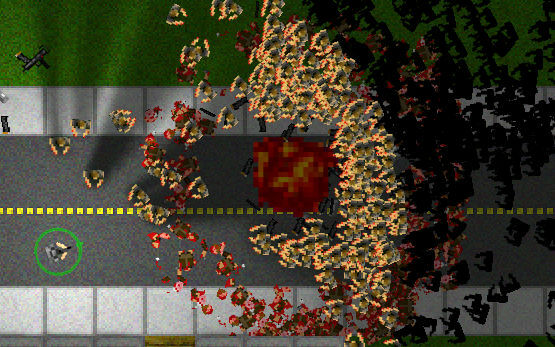 They are randomly generated, and spawn as what looks like a barrel of toxic waste or something, giving you no indication as to what you’ll get, sometimes leading to frustrating situations where you risk life and limb for a power-up, braving the zombie horde in the open in the hopes of getting an awesome upgrade like GOD MODE or NO RELOADING, only to find… Incendiary bullets. Great. Now my rounds (that were already mulching through zombies like they aren’t there) can do damage over time. That’s “useful”. 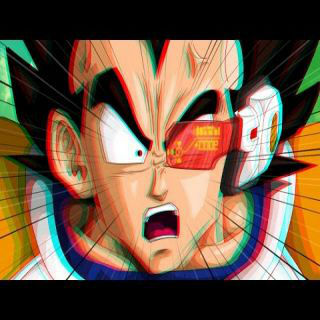 However, sometimes the right power-up can mean the difference between life and death. Once, when playing with Fenton, he went down around wave 6. I was on 2HP, meaning that the next zombie to hit me would mean game over. Zombies to the left, zombies to the right, and concrete walls hemming in on my other sides, I pulled out my most powerful gun and prepared to die taking as many of the undead bastards with me as possible, when I saw it drop not 2 pixels from where I was standing. God Mode. The invincibility lasted long enough to see Fenton back on his feet, and the day was saved. Like I said, I like power-ups. On the other hand, perhaps the most impressive thing about this game is the lighting. The shadows in particular are awesome, with zombies casting blackness across the screen, obscuring their kin from your view, especially at night. Unfortunately, the game’s biggest flaw comes off the back of it’s greatest strength. The game is multiplayer focused, meaning that it’s hard to play single player. Like unplayabley hard. I found it difficult to get past the first couple waves, and hordes designed for multiple players to handle simply overwhelmed me. The fact that you can only have 6 turrets total didn’t really help. Normally, this would be a huge issue, however, since it’s obviously a multiplayer game, and not a full-price release, I’ll let it off with simply adding a disclaimer. DO NOT BUY THIS IF YOU DON’T PLAN TO PLAY WITH FRIENDS.